Apple iPads ship with the Safari browser in all versions of the iOS so you can surf the net and visit websites just like you do on your desktop or laptop computer. The method of bookmarking a web page on the iPad is a little different from the way you do it on a computer, though, and it isn't particularly obvious. Open the Safari browser by tapping on the Safari icon, which is located on the ​iPad home screen, unless you moved it to a different location. 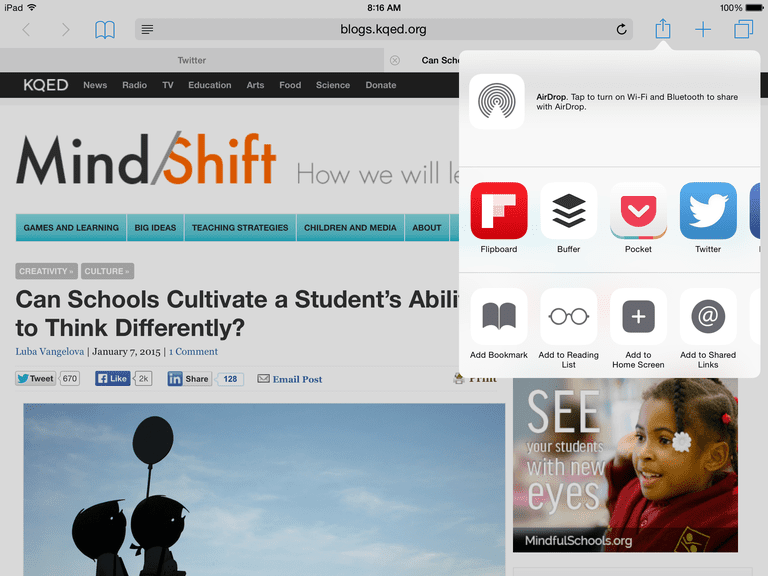 After the page finishes rendering, select Safari's Share icon, which looks like a square containing an up arrow. It is located in the browser's main toolbar, next to the field containing the URL. Select the Add Bookmark option from the pop-up screen that opens. View the title and full URL of the current page that you are bookmarking along with its favicon. The title text is editable. Tap the circled X in the title field to delete it and type in a replacement title. The location where your new bookmark will be stored is also editable. The Favorites folder is the default, but you can choose another folder by tapping on Favorites and selecting a different folder. When you are satisfied with the settings, tap the Save button, which saves the new bookmark and takes you back to the main Safari window. To access a stored bookmark, select the Bookmark icon—the one that looks like an open book—located at the top of the screen. A new panel appears where you can tap on Favorites—or any other folder—to view the bookmarked sites in the folder. Tap on any bookmark to open the web page in Safari. At the bottom of the bookmark panel is an Edit option you can tap to add new folders or to delete bookmarked sites from the list. You can also rearrange the order of the bookmarks in a folder by pressing and holding as you drag a bookmark up or down in the list. When you are finished making changes, tap Done. If you have more than one Apple computer or mobile device and have set Safari to sync between them using iCloud, any change you make to your bookmarks on Safari on your iPad will be duplicated in Safari on the other synced devices. If you choose to Add to the Home Screen in the Share screen instead of Add Bookmark, Safari places an icon on the home page of the iPad to use as a shortcut to that web page instead of bookmarking it.